This industry overview will discuss the latest statistics and trends for those interested in the coffee business. Limited-service eating places: In Canada, this is the industry category for coffee shops. In this category, food and drinks are paid for prior to consumption and typically picked up at the counter to eat at the retail location or as takeout. Snack and Non-alcoholic Beverage Bars: In the US, this is the coffee shop industry category; do not confuse this with limited-service restaurants, which excludes coffee shops. Coffee and Tea Manufacturing: This is the industry category for coffee roasters and tea blenders. This has been included as some independent coffee shops roast their own coffee beans. For more specific information about researching the coffee shop industry, please see our Coffee Shops and Coffee Manufacturing Guide. For an overview of the overall Restaurant industry, please see our Restaurant Industry Overview. For information about related industries please see our industry guides for restaurants, caterers, bakeries, specialty foods, and street food vendors. Starting a coffee shop has a low barrier to entry due to the lower amount of capital required to start a business. Coffee roasting has a very high barrier to entry; but if you are not planning to sell your roasted coffee on the mass market in places such as grocery stores, this barrier is significantly lower (Ozelkan, 2018). 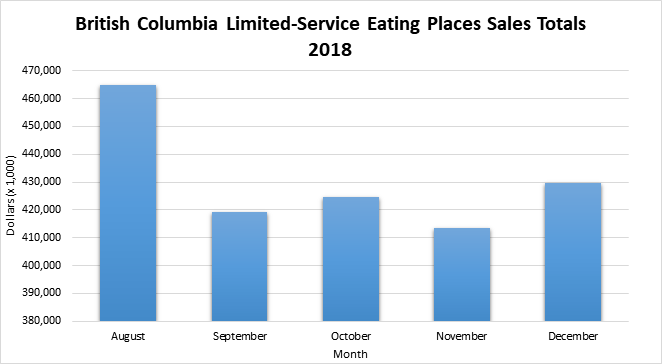 Most limited-service eating places and coffee and tea manufacturing companies in British Columbia have fewer than 50 employees, as shown in the charts below. 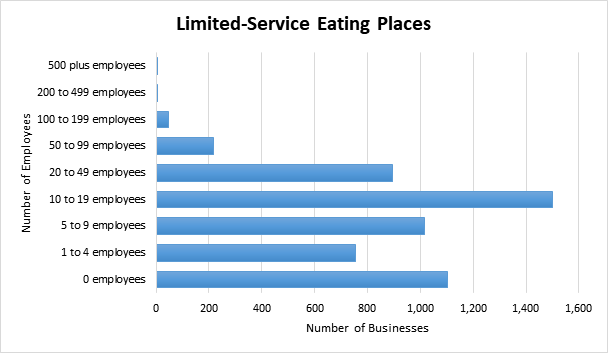 Limited-service eating places encompasses eating places beyond coffee shops, but most are not large chains, contributing to the high competition in the industry. 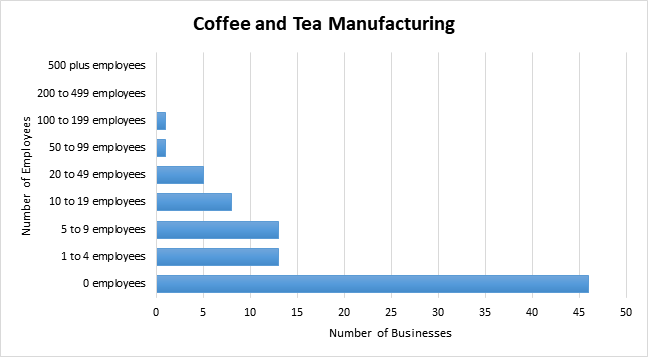 There are fewer coffee and tea manufacturing companies, and they tend have no employees because of the local and small markets they serve as well as the high barriers to entry. 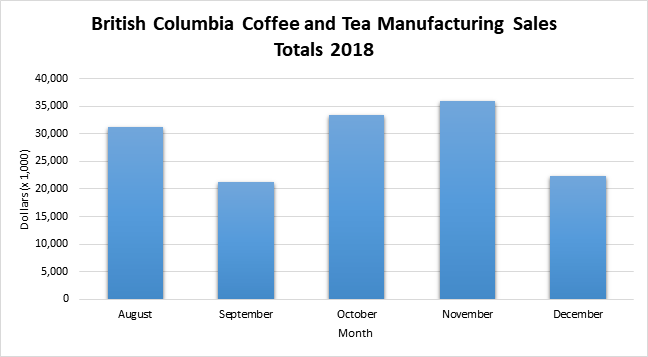 Both coffee shops and coffee and tea production will see their growth trend of the past five years continue, at a slightly slower rate than previously. The growth rate is being negatively impacted by economic stagnation and a stronger Canadian dollar (Sayler, 2018; Ozelkan, 2018). 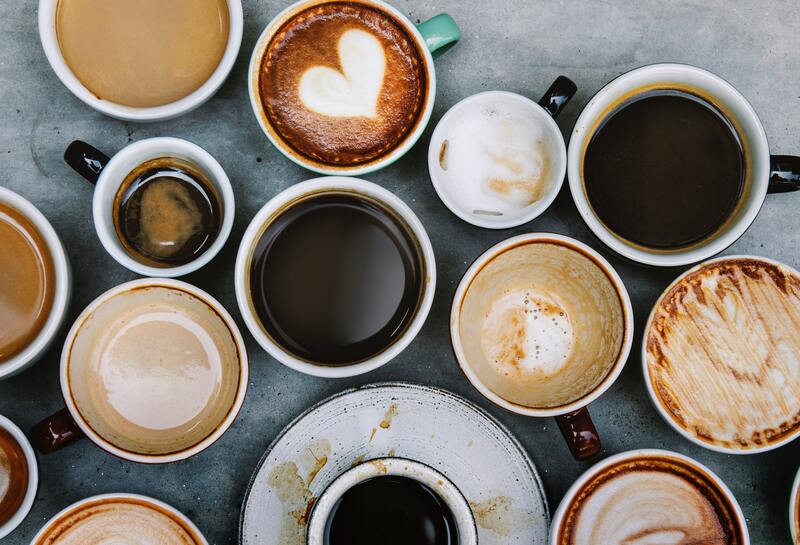 Canada is one of the largest consumers of coffee in the world (the conversation), with 82% of Canadians drink coffee every week (Coffee Association of Canada, 2018). In coffee and tea production, low harvest yields have resulted in more expensive coffee beans and tea leaves (Ozelkan, 2018). It is expected that many of the areas in which coffee is grown will no longer be able to grow coffee due to climate change (Charlebois, 2018). An increasing number of consumers are purchasing specialty coffee, in which the coffee is considered an artisanal product and is analyzed in a similar way to wine (Draper, 2019); the focus is on offering consumers a particular experience with a product (Schalk, 2018). This segment has grown over the past five years (Sayler, 2018), and it now represents about 60% of coffee consumed in the US (First Research Industry Profile, 2018). Offering specialty coffee that cannot be obtained in other shops also provides small coffee shops with a competitive advantage over large chains (First Research Industry Profile, 2018). 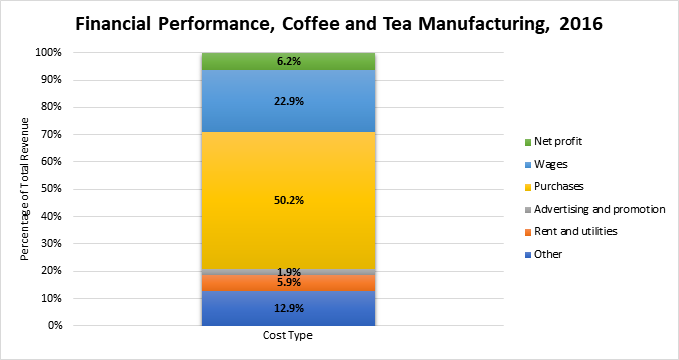 These charts show how revenue in both limited-service eating places and coffee and tea manufacturing is spent. Overall, 67.9% of limited-service eating places and 69.0% of coffee and tea manufacturing businesses are profitable (Statistics Canada, 2018). Statistics Canada. (2018). 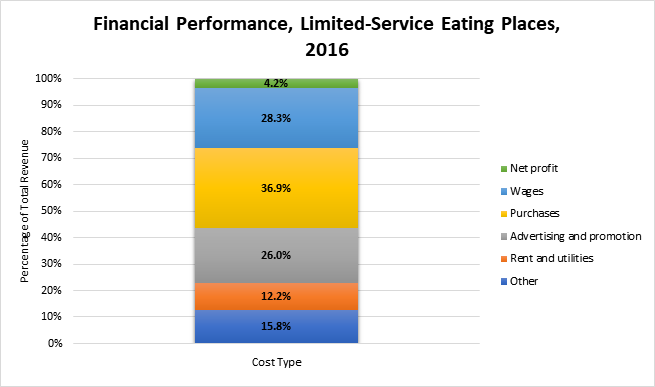 Report for: NAICS 722512 - Limited-service eating places - Financial Performance Data. Sayler, B (2017). Coffee and snack shops in Canada (IBISWorld Industry Report 72221bCA). Retrieved from IBISWorld Inc.
Ozelkan, E. (2018). Coffee and tea production in Canada (IBISWorld Industry Report 31192CA). Retrieved from IBISWorld Inc. The Xwi7xwa Library is located on the ancestral and unceded territory of the hən̓q̓əmin̓əm̓-speaking Musqueam people. It is adjacent to the UBC’s First Nations House of Learning, (FNHL) and is the only separate library dedicated to Indigenous collections and services at an academic institution in Canada. An agreement outlines the relationship between the First Nations House of Learning and Library. Xwi7xwa Library’s work is guided by the UBC Library strategic plan, the 2009 UBC Aboriginal Strategic Plan, ongoing University initiatives, and responses to the Calls to Action in the report of the Truth and Reconciliation Commission. The Xwi7xwa Library is a world leader in the effective organization and respectful use of Indigenous knowledge and information in academic inquiry. The Library is key to developing UBC’s capacity for advanced work in Indigenous studies and engagement by providing expert staff, unique collections and collaborative space for supporting respectful academic inquiry through teaching, research, and community partnerships. The Xwi7xwa Library provides leadership and support across the UBC Library to develop improved access to collections and services that support Indigenous perspectives in all fields of study and research and to further the development of the skills to do so in all units of UBC Library. In collaboration with UBC Library Technical Services, Xwi7xwa Library leads in the development of descriptive systems that are based in Indigenous Knowledge Organization, an evolving and emergent area of research and operations. The Library fosters collaborative relationships with Indigenous programs and services at UBC and works closely with the Indian Residential School History and Dialogue Centre, other academic units, and community partners to ensure respectful access to materials and critical understanding of Canadian and Indigenous history. Through building and maintaining relationships with a vibrant network of current and former faculty, staff and students, the Xwi7xwa Library connects the intellectual life of the campus with diverse communities, and serves as a facilitator to many longstanding collaborative knowledge-based projects and initiatives. Community scholars and educators entrust Xwi7xwa Library with locally developed resources, which form many of the unique materials in the collection. Xwi7xwa Library has an active and well-regarded profile in public programming at the Irving K. Barber Learning Centre and other venues that helps to increase campus awareness of Indigenous issues and their relevance, depth, and complexity. The Library participates with the Museum of Anthropology, the Barber Centre, the First Nations House of Learning and many other campus units and community partners in information dissemination and service initiatives. Xwi7xwa Library has a close relationship with the First Nations Curriculum Concentration, (FNCC) in the iSchool. It draws students from FNCC to work as graduate academic assistants while at the same time acting as a draw for applicants to the iSchool. The Library actively supports FNCC students by participating in the experiential learning programs offered at the iSchool – through hosting class visits and guest lecturing, as well as offering co-op placements, professional, and practicum experiences. The Xwi7xwa Library has an important and ongoing role in strategic initiatives in Indigenous research and knowledge organization, and the role of Head Librarian is critical to that function. The nature and scope of this position are expected to change as Indigenous studies, the Library’s organizational structure, and the Library’s strategic position evolve. The Head, Xwi7xwa Library, is responsible for providing strategic leadership for people, services and operations including the development of collections, services, and user spaces and is charged with positioning the Xwi7xwa Library as a vital resource in advancing Indigenous scholarship at the University and beyond. The scope of this position includes the organization, administration, and operation of the Xwi7xwa Library, for the development of its collection, for the provision of effective reference, instructional, and circulation services, and for outreach to partners on and off campus, and to Indigenous and library communities and organizations in Canada and abroad. A graduate degree from an accredited school of Library, Archival and Information Science. An undergraduate degree in a subject area relevant to Indigenous studies or equivalent knowledge gained through professional experience in relevant subject areas. A nuanced understanding of Indigenous histories, initiatives and subject materials. Demonstrated understanding of the experiences of Indigenous people and communities and experience working with Indigenous people and communities. Demonstrated effective administrative, management and leadership skills developed and demonstrated by progressively responsible work experiences. Experience in managing a complex budget. Contributes to the Library’s sense of community and achievement of common goals through cooperation across units and encouragement of equitable and balanced involvement in decision making. Promotes and fosters a supportive and open environment built on appreciation, recognition, learning and professional growth. A graduate degree with an Indigenous focus. Experience with knowledge-based description systems such as Brian Deer Classification and subject headings used in an Indigenous context. Relevant professional experience, familiarity with bibliography, faculty-library liaison, electronic services, collection development and library instruction. Experience in leading, developing and implementing strategic priorities, preferably within a large academic research library. The Head, Xwi7xwa Library works under the general direction of and is responsible to the University Librarian, or designate, and the Director of the First Nations House of Learning. The Head supervises a team comprising a public services librarian, an Aboriginal engagement librarian in a position shared with the Irving K. Barber Learning Centre, two support staff and several part-time graduate academic assistants. The Head consults with the appropriate AUL/Manager/Director/Head concerning the budget for collections, ordering and processing of Library materials, and collection development and preservation; financial and facilities matters; systems issues; human resources; and development. The Head cooperates with the Heads of other branches and divisions in the provision of services and the development of collections, and ensures that relevant issues are discussed with the Director, the Associate Director, or other administrators within the First Nations House of Learning. The Head consults with other members of the UBC Library, First Nations House of Learning, community members, and an advisory committee. The Head also works with relevant external organizations and community partners. The nature and scope of this position are expected to change as Indigenous studies, the Library’s organizational structure, and the Library’s strategic position evolve. Provides vision and leadership for the Xwi7xwa Library operation and services. Develops and implements strategies, goals, and objectives that support the UBC Aboriginal Strategic Plan and UBC Library’s strategic plan, and are responsive to the Truth and Reconciliation Commission (TRC) Calls to Action. Creates a supportive environment for the librarians and CUPE staff in Xwi7xwa Library. Plans for staff development and training by determining the needs of the unit including individual staff needs. Allocates time for training and development. Provides a welcoming environment for Indigenous faculty, staff, students and community members. Assesses the needs of Xwi7xwa Library users by consulting broadly with UBC’s Indigenous community and faculty, researchers, staff and students engaged in First Nations research and scholarship. Maintain knowledge of curriculum changes, program development, and new areas of research. Develop programs and services in response to expressed needs. Establishes develops and works with a Library Advisory Committee comprised of key stakeholders. Sets and implements branch priorities. Plans, organizes and manages the people, services and operation of Xwi7xwa Library to enable the successful fulfilment of the Library’s and UBC’s mission and vision regarding Indigenous peoples. Plans, develops and manages the Xwi7xwa Library operating budgets annually. Develops a programs-based budget for the FNHL funds. Allocates and monitors resources by setting unit priorities, allocating funds/human resources and monitoring expenditures. Reviews curriculum changes and program development, maintaining liaison with faculty and participating in departmental and faculty meetings as invited. Develops collections policies, determines the scope of the collection, and selects and orders materials. Oversees Xwi7xwa special collections and archives in conjunction with Rare Books and Special Collections and University Archives. Works with UBC Library Technical Services in the development of descriptive systems that are based in Indigenous Knowledge Organization. Develops and maintains a plan for collection curation that maximizes the strategic value of the Xwi7xwa Library building and leverages relationships with other facilities to support collection distribution as required. Oversees and participates in the provision of reference, circulation, cataloguing and instructional services. Evaluates existing services, adjusts priorities, allocates human resources and seeks funding as appropriate. Develops and maintains a good knowledge of Indigenous issues, concerns, and programs to ensure that the Xwi7xwa Library continues to meet the needs of UBC faculty, staff, and students, and Indigenous communities and organizations, and groups and individuals with an interest in Indigenous issues. Liaises with Indigenous groups to develop Indigenous library and information sciences capacity and provides professional and technical advice as appropriate. Provides leadership to Indigenous librarians, archivists, information managers, and researchers by participation in Indigenous and information management organizations. Supports fundraising initiatives for the Xwi7xwa Library and participates in the preparation of grant requests and administration of grants. Initiates involvement with the Library Development Office as appropriate opportunities occur. Participates in professional and university wide initiatives. Effective development of collections and services in the Xwi7xwa Library and an awareness of developments affecting Administrative effectiveness and a creative approach to cost effective provision of services and the ability to determine priorities and implement changes within a fiscally prudent environment. Excellent interpersonal skills. Effective strategic planning. The unique positioning of the Xwi7xwa Library, its potential as a dedicated space for Indigenous holdings and research, and the necessity for effective use of its limited physical space require acuity in planning and awareness of developments across the Library, university, and larger political and social landscape. Effective liaison and collaboration with Indigenous faculty, staff, students, community members, and community partners. The very special nature of the Xwi7xwa Library depends upon these relations and the knowledge, skill, and experience of the Head in developing and maintaining them. This position will be filled as a full-time, ongoing General Librarian position with a five year renewable administrative term as Head, Xwi7xwa Library. If eligible and qualified, the successful applicant may be appointed with a confirmed appointment. Otherwise, there will be an initial three-year probationary appointment. Normally, such an appointment is reviewed by the end of the second year of the appointment, and a recommendation is made at that time to grant or not to grant a confirmed appointment. To view the complete job description and to submit an application, please visit the UBC Careers page at http://www.hr.ubc.ca/careers-postings/faculty.php by midnight on April 21st, 2019.